James Comey has gone from supremely smug to increasingly concerned as the long list of alleged crimes he committed during his tenure as FBI Director continues to grow. Perhaps most notable are his repeated leaks of classified information in what was a clearly politically-motivated attempt to do harm to a then-newly elected president. Comey’s team is said to be considering shortening/ canceling his book tour and limiting all future media appearances. His publisher apparently wants the tour to continue, likely thinking bad press is still good press when it comes to potential book sales. Speaking of which any help in that regard is needed as the book tour has been marked by small turnouts and overall interest by readers toward the Comey tell-all has been minimal. According to a DAILY CALLER report out today, former Trump campaign manager Corey Lewandowski was in no mood to play double-speak with House Democrats trying to convince him there was any substance to alleged collusion between the Trump campaign and the Russian government. Lewandowski said he wasn’t playing that game – though with far more aggressively colorful language. Lewandowski was the final witness in the committee’s probe into Russian interference and appeared in front of the committee for the second time last month. Democrats were said to be unhappy and outraged by Mr. Lewandowski’s STFU stance. James Kallstrom is no joke. With nearly thirty years in the FBI, several of them as the Assistant Director, Kallstrom knows how the agency functions far more than most. So when he says there was a plot to protect Hillary Clinton from prosecution and to illegally influence the 2016 Election people should pay attention. Kallstrom goes on to call the entirety of the FBI investigation against Donald Trump completely phony. Maria Bartiromo’s own take appears very much to compliment Mr. Kallstrom’s assertions. The Deep State shenanigans run very deep and in 2016 are linked to the Obama White House. Barack Obama wanted a third term. His support-system within the FBI, DOJ, State Department, CIA, the Establishment Media, etc., wanted the same and they all broke the law in their attempt to do it. Donald Trump has managed to reveal much of it. The media continues to ignore it because so many of them are implicated in the illegal manipulations of the public as well. That means it’s up to YOU to bypass the media and help to spread the truth of what is really going on. REPORT: High-Ranking Obama Official Has Lawyered Up – Uses Her Right To Remain Silent. Check it out. What follows are the answers from former Obama official Susan Rice that D.C. Whispers indicated a year ago was among those the administration was willing to let take the fall for multiple egregious surveillance program misdeeds intended to manipulate the 2016 Election. By letter to Susan Rice dated February 8, 2018, Senators Grassley and Graham posed 12 numbered questions. I posted the Graham/Grassley letter in “Rice papers the file.” By letter dated February 23, 2018, white collar criminal defense lawyer Kathryn Ruemmler has now responded to the Grassley/Graham letter on Rice’s behalf. I posted Ruemmler’s letter nearby this morning in “Susan Rice responds, sort of,” and am embedding it again at the bottom. Question 3. When did you become aware of any surveillance activities, including FISA applications, undertaken by the FBI in conducting that investigation? At the time you wrote this email to yourself, were you aware of either the October 2016 FISA application for surveillance of Carter Page or the January 2017 renewal? Question 4. Did anyone instruct, request, suggest, or imply that you should send yourself the aforementioned Inauguration Day email memorializing President Obama’s meeting with Mr. Comey about the Trump/Russia investigation? If so, who and why? Question 5. Is the account of the January 5, 2017 meeting presented in your email accurate? Did you omit any other portions of the conversation? Question 6. Other than that email, did you document the January 5, 2017 meeting in any way, such as contemporaneous notes or a formal memo? To the best of your knowledge, did anyone else at that meeting take notes or otherwise memorialize the meeting? Question 7. During the meeting, did Mr. Comey or Ms. Yates mention potential press coverage of the Steele dossier? If so, what did they say? Answered narrowly (“In the conversation Ambassador Rice documented, there was no discussion of Christopher Steele or the Steele dossier, contrary to the suggestion in your letter”). Question 8. During the meeting, did Mr. Comey describe the status of the FBI’s relationship with Mr. Steele, or the basis for that status? Question 9. When and how did you first become aware of the allegations made by Christopher Steele? Question 10. When and how did you first become aware that the Clinton Campaign and the Democratic National Committee funded Mr. Steele’s efforts? Question 11. You wrote that President Obama stressed that he was not asking about, initiating or instructing anything from a law enforcement perspective. Did President Obama ask about, initiate, or instruct anything from any other perspective relating to the FBI’s investigation? Question 12. Did President Obama have any other meetings with Mr. Corney, Ms. Yates, or other government officials about the FBI’ s investigation of allegations of collusion between Trump associates and Russia? If so, when did these occur, who participated, and what was discussed? Susan Rice has lawyered up. For some reason or other, with respect to several pointed and important questions, she is resting on her right to remain silent. Special Counsel Robert Mueller was expected to have done far more damage to the Trump White House by now. After months of wasted time and tens of millions of tax dollars, the increasingly agitated Establishment Media and D.C. elites are wondering and waiting for something to come of it all. Whispers now indicate Mr. Mueller is more focused and determined than ever on trying to orchestrate obstruction charges against the President of the United States and currently fast-tracking his plans to do so. He either refuses the interview and is then lambasted by the media as a guilty man hiding behind the powers of President. Or, he gives the interview and is tripped up on past statements of fact and declared to have perjured himself. Either option opens the door for Democrats, should they win back the House (a scenario that is becoming less likely for them at the moment) to proceed with articles of impeachment. Apparently the attempt to proceed with the above scenario is coming soon. Certainly the Trump White House has been preparing. It will be fascinating to see what a notorious counter-puncher like Donald Trump comes back with. A lesser man would have buckled under the onslaught of repeated attacks by now. Remarkably, Mr. Trump somehow appears to grow stronger. Robert Mueller continues to undergo a fake investigation into fake allegations of collusion between the then-Trump campaign and the Russian government. After 18 months no such evidence has come forward to substantiate the claims by the far left. In fact, the only real evidence of collusion appears to be that of the Obama FBI attempting to interfere in the 2016 election. Ah, but quietly marching alongside the Mueller investigation is an equally far-reaching (and much more legitimate) investigation into how the Obama government handled the Clinton email investigation. 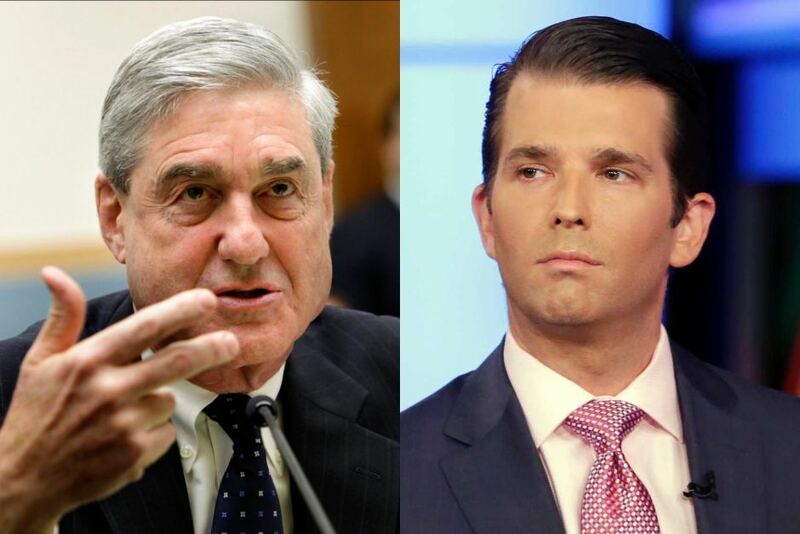 It has been this investigation which is now countering the falsehoods of the Trump-Russia narrative and is acting as a truthful counterbalance to the Mueller-led anti-Trump Deep State operation – which is why the Establishment Media has been largely ignoring it.